Guterres, Alexandro and de Lemos, Elba Regina Sampaio 2018. Hantaviruses and a neglected environmental determinant. One Health, Vol. 5, Issue. , p. 27. Damasceno, Juliana Genaro, Gelson and Terçariol, César Augusto Sangaletti 2016. Effect of the presence of a person known to the cats on the feeding behavior and placement of feeders of a domestic cat colony. Journal of Veterinary Behavior, Vol. 11, Issue. , p. 31. Lei, Weiwei Ravoninjohary, Aurore Li, Xia Margolskee, Robert F. Reed, Danielle R. Beauchamp, Gary K. Jiang, Peihua and Behrens, Maik 2015. Functional Analyses of Bitter Taste Receptors in Domestic Cats (Felis catus). PLOS ONE, Vol. 10, Issue. 10, p. e0139670. Okamatsu, Gaku Komatsu, Tetsuya Kubota, Akira Onaga, Takenori Uchide, Tsuyoshi Endo, Daiji Kirisawa, Rikio Yin, Guojun Inoue, Hiroki Kitazawa, Takio Uno, Yasuhiro and Teraoka, Hiroki 2015. Identification and functional characterization of novel feline cytochrome P450 2A. Xenobiotica, Vol. 45, Issue. 6, p. 503. Damasceno, Juliana and Genaro, Gelson 2014. Dynamics of the access of captive domestic cats to a feed environmental enrichment item. Applied Animal Behaviour Science, Vol. 151, Issue. , p. 67. Allaway, David Kamlage, Beate Gilham, Matthew S. Hewson-Hughes, Adrian K. Wiemer, Jan C. Colyer, Alison and Rein, Dietrich 2013. Effects of dietary glucose supplementation on the fasted plasma metabolome in cats and dogs. Metabolomics, Vol. 9, Issue. 5, p. 1096. Pietsch, Stephanie J. Hobson, Keith A. Wassenaar, Leonard I. Tütken, Thomas and Halsey, Lewis George 2011. Tracking Cats: Problems with Placing Feline Carnivores on δ18O, δD Isoscapes. PLoS ONE, Vol. 6, Issue. 9, p. e24601. Bennett, Cynthia L. Booth-Binczik, Susan D. and Steele, Suzy R. E. 2010. Nutritional composition and digestibility by ocelots (Leopardus pardalis) of whole animals and a commercial diet. Zoo Biology, Vol. 29, Issue. 6, p. 753. Caulfield, C. D. Kelly, J. P. Jones, B. R. Worrall, S. Conlon, L. Palmer, A. C. and Cassidy, J. P. 2009. The Experimental Induction of Leukoencephalomyelopathy in Cats. Veterinary Pathology, Vol. 46, Issue. 6, p. 1258. Zaghini, G. and Biagi, G. 2005. Nutritional Peculiarities and Diet Palatability in the Cat. Veterinary Research Communications, Vol. 29, Issue. S2, p. 39. Williams, D. L. Heath, M. F. and Wallis, C. 2004. Prevalence of canine cataract: preliminary results of a cross-sectional study. Veterinary Ophthalmology, Vol. 7, Issue. 1, p. 29. Riond, J.-L. Stiefel, M. Wenk, C. and Wanner, M. 2003. Nutrition studies on protein and energy in domestic cats. Journal of Animal Physiology and Animal Nutrition, Vol. 87, Issue. 5-6, p. 221. Bradshaw, J.W.S. Healey, L.M. Thorne, C.J. Macdonald, D.W. and Arden-Clark, C. 2000. Differences in food preferences between individuals and populations of domestic cats Felis silvestris catus. Applied Animal Behaviour Science, Vol. 68, Issue. 3, p. 257. Bradshaw, J.W.S Horsfield, G.F Allen, J.A and Robinson, I.H 1999. Feral cats: their role in the population dynamics of Felis catus. Applied Animal Behaviour Science, Vol. 65, Issue. 3, p. 273. Ballard, F. J. (1965). Glucose utilization in mammalian liver. Comparative Biochemistry & Physiology 14, 437–443. Burger, I. H., Blaza, S. E., Kendall, P. T. & Smith, P. M. (1984). The protein requirement of adult cats for maintenance. Feline Practice 14, 8–14. Burger, I. H. & Smith, P. M. (1987). Amino acid requirements of adult cats. In Nutrition, Malnutrition and Dietetics in the Dog and Cat, pp. 49–51 [Meyer, H., Kienzle, E. and Edney, A. T. B. editors]. London: British Veterinary Association. Czarnecki, G. L. & Baker, D. H. (1984). Urea-cycle function in the dog with emphasis on the role of arginine. Journal of Nutrition 114, 581–590. Da Silva, A. C., Fried, R. & De Angelis, R. C. (1952). The domestic cat as a laboratory animal for experimental nutrition studies. Journal of Nutrition 46, 399–409. De Castro, F. T., Brown, R. R. & Price, J. M. (1957). The intermediary metabolism of tryptophan by cat and rat tissue preparations. Journal of Biological Chemistry 228, 777–784. Douglass, G. M., Fern, E. B. & Brown, R. C. (1991). Feline plasma and whole blood taurine levels as influenced by commercial dry and canned diets. Journal of Nutrition 121, S179–S180. Earle, K. E. & Smith, P. M. (1991). The effect of dietary taurine content on the plasma taurine concentration of the cat. British Journal of Nutrition 66, 227–235. Frankel, T. L. (1980). Essential fatty acid deficiency in the cat (Felis catus L.). PhD Thesis. Wolfson College, University of Cambridge. Frankel, T. L. & Rivers, J. P. W. (1978). The nutritional and metabolic impact of γ-linoleic acid (18:3n-6) on cats deprived of minimal lipid. British Journal of Nutrition 39, 227–231. Gershoff, S. N., Andrus, S. B., Hegsted, D. M. & Lentini, E. A. (1957). Vitamin A deficiency in cats. Laboratory Investigation 6, 227–240. Hardison, W. G. M., Wood, C. A. & Proffitt, J. H. (1977). Quantification of taurine synthesis in the intact rat and cat liver. Proceedings of the Society for Experimental Biology and Medicine 155, 55–58. Hassam, A. G., Rivers, J. P. W. & Crawford, M. A. (1977). The failure of the cat to desaturate linoleic acid; its nutritional implication. Nutrition and Metabolism 21, 321–328. Hayes, K. C., Carey, R. E. & Schmidt, S. Y. (1975). Retinal degeneration associated with taurine deficiency in the cat. Science 188, 949–951. Hickman, M. A., Morris, J. G. & Rogers, Q. R. (1992). Intestinal taurine and the enterohepatic circulation of taurocholic acid in the cat. Advances in Experimental Medicine and Biology 315, 45–54. Ikeda, M., Tsuji, H., Nakamura, S., Ichiyama, A., Nichizuka, Y. & Hayaisi, O. (1965). Studies on the biosynthesis of nicotinamide adenine dinucleotide from tryptophan in mammals. Journal of Biological Biochemistry 240, 1395–1401. Kettlehut, I. C., Foss, M. C. & Migliorini, R. H. (1978). Glucose homeostasis in a carnivorous animal (cat) and in rats fed a high-protein diet. American Journal of Physiology 239, R115–R121. Knopf, K., Sturman, J. A., Armstrong, M. & Hayes, K. C. (1978). Taurine: an essential nutrient for the cat. Journal of Nutrition 108, 773–778. Legrand-Defretin, V. & Munday, H. S. (1993). Feeding cats and dogs for life. In The Waltham Book of Companion Animal Nutrition, pp. 57–68 [Burger, I. H. editor]. Oxford: Pergamon Press. MacDonald, M. L., Rogers, Q. R. & Morris, J. G. (1984). Nutrition of the domestic cat, a mammalian carnivore. Annual Review of Nutrition 4, 521–562. Meyer, H. & Kienzle, E. (1991). Dietary protein and carbohydrates: relationship to clinical disease. 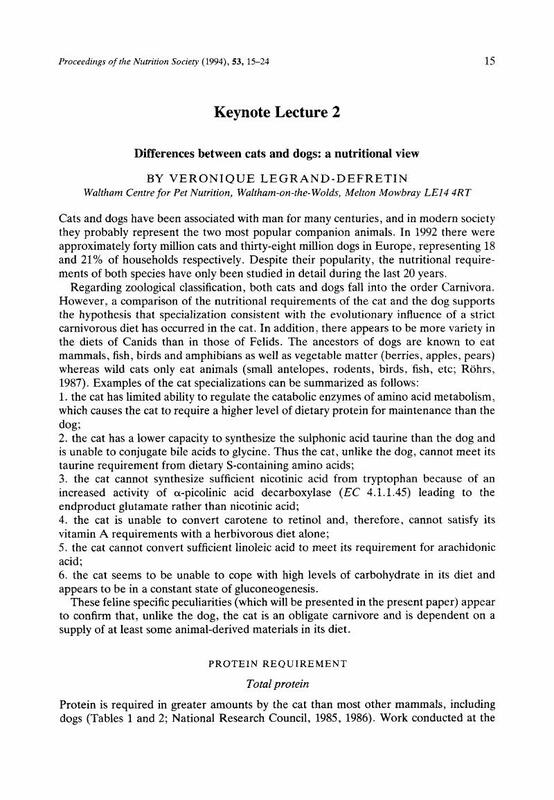 In Proceedings of Purina International Symposium (in association with Eastern States Veterinary Conference, 1991), pp. 13–26. Gainesville: Eastern States Veterinary Association. Morris, J. G. (1985). Nutritional and metabolic responses to arginine deficiency in carnivores. Journal of Nutrition 115, 524–531. Morris, J. G. & Rogers, Q. R. (1978 a). Ammonia intoxication in the near-adult cat as a result of a dietary deficiency of arginine. Science 199, 431–432. Morris, J. G. & Rogers, Q. R. (1978 b). Arginine: an essential amino acid for the cat. Journal of Nutrition 108, 1944–1953. Morris, J. G. & Rogers, Q. R. (1989). Comparative aspects of nutrition and metabolism of dogs and cats. In Nutrition of the Dog and Cat. Waltham Symposium 7, pp. 35–66 [Burger, I. H. and Rivers, J. P. W. editors]. Cambridge: Cambridge University Press. Morris, J. G. & Rogers, Q. R. (1992). The metabolic basis for the taurine requirement of cats. Advances in Experimental Medicine and Biology 315, 33–44. Morris, J. G. & Rogers, Q. R., Winterrowd, D. L. & Kamikawa, E. M. (1979). The utilization of ornithine and citrulline by the growing kitten. Journal of Nutrition 109, 724–729. Morris, J. G., Trudell, J. & Pencovic, T. (1977). Carbohydrate digestion by the domestic cat (Felis catus). British Journal of Nutrition 37, 365–373. Mundt, H.-C. & Meyer, H. (1989). Pathogenesis of lactose-induced diarrhoea and its prevention by enzymatic splitting of lactose. In Nutrition of the Dog and Cat, Waltham Symposium 7, pp. 267–274 [Burger, I. H. and Rivers, J. P. W. editors]. Cambridge: Cambridge University Press. National Research Council (1985). Nutrition Requirements of Dogs. Washington D.C.: National Academy Press. National Research Council (1986). Nutrient Requirements of Cats. Washington D.C.: National Academy Press. Park, T., Jerkins, A. A., Steele, R. D., Rogers, Q. R. & Morris, J. G. (1991). Effect of dietary protein and taurine on enzyme activities involved in cysteine metabolism in cat tissues. Journal of Nutrition 121, S181–S182. Pion, P. D., Kittleson, M. D. & Rogers, Q. R. (1989). Cardiomyopathy in cats and its relation to taurine deficiency. In Current Veterinary Therapy, vol. 10, pp. 251–262 [Kirk, R. W. editor]. Philadelphia: W. B. Saunders. Pion, P. D., Kittleson, M. D., Rogers, Q. R., & Morris, J. G. (1987). Myocardial failure in cats associated with low plasma taurine: a reversible cardiomyopathy. Science 237, 764–768. Rivers, J. P. W., Hassam, A. G. & Alderson, C. (1976 a). The absence of ω-desaturase activity in the cat. Proceedings of the Nutrition Society 35, 67A. Rivers, J. P. W., Hassam, A. G., Crawford, M. A. & Brambell, M. R. (1976 b). The inability of the lion, Panthera Leo, to desaturate linoleic acid. FEBS Letters 67, 269–270. Rivers, J. P. W., Sinclair, A. J. & Crawford, M. A. (1975). Inability of the cat to desaturate essential fatty acid. Nature 258, 171–173. Rivers, J. P. W., Sinclair, A. J., Moore, D. P. & Crawford, M. A. (1976 c). The abnormal metabolism of essential fatty acids in the cat. Proceedings of the Nutrition Society 35, 66A. Rogers, Q. R. (1963). A study of felinine and its excretion by the cat. PhD Thesis. State University, NY, Buffalo. Rogers, Q. R., Morris, J. G. & Freedland, R. F. (1977). Lack of hepatic enzyme adaptation to low and high levels of dietary protein in the adult cat. Enzyme 22, 348–356. Rogers, Q. R. & Phang, J. M. (1985). Deficiency of pyrroline-5-carboxylate synthetase in the intestinal mucosa of the cat. Journal of Nutrition 115, 146–150. Röhrs, M. (1987). Domestication of wolves and wild cats: parallels and differences. In Nutrition, Malnutrition and Dietetics in the Dog and Cat, pp. 1–5 [Meyer, H., Kienzle, E. and Edney, A. T. B. editors]. London: British Veterinary Association. Rowsell, E. V., Carnie, J. A., Wahbi, S. D., Al-Tai, A. H. & Rowsell, K. V. (1979). L-serine dehydratase and L-serine-pyruvate aminotransferase activities in different animal species. Comparative Biochemistry & Physiology 637, 543–555. Schaeffer, M. C., Rogers, Q. R. & Morris, J. G. (1989). Protein in the nutrition of dogs and cats. In Nutrition of the Dog and Cat. Waltham Symposium 7, pp. 159–205 [Burger, I. H. and Rivers, J. P. W. editors]. Cambridge: Cambridge University Press. Sinclair, A. J., McLean, J. G. & Monger, E. A. (1979). Metabolism of linoleic acid in the cat. Lipids 14, 932–936. Sturman, J. A., Gargano, A. D., Messing, J. M. & Imaki, H. (1986). Feline maternal taurine deficiency: effect on mother and offspring. Journal of Nutrition 116, 655–667. Sturman, J. A., Rassin, D. K., Hayes, K. C. & Gaull, G. E. (1978). Taurine deficiency in the kitten: Exchange and turnover of [35S] taurine in brain, retina and other tissues. Journal of Nutrition 108, 1462–1476. Turner, R. G. (1934). Effect of prolonged feeding of raw carrots on vitamin A content of liver and kidneys in the dog. Proceedings of the Society for Experimental Biology and Medicine 31, 866–868.